Here we have a beautifully hand crafted Sheperd’s Hut, Hand Built by a professional carpenter with over 40 years experience. This was a no expense spared restoration, The whole hut was built using high quality timber frame with ply cladding and a corrugated powder coated steel sheet finish for durability. Fully insulated throughout, It has standard UK plug’s mated to a 12 volt electric system and a 240v hook up, it can also be plugged in to get main power from your home. Every part of this build was bespoke and hand made using tradition techniques, the floor was even hand plained! It has timber cladding on the walls and a curved wooden ceiling. Inside, it has double bed on the raised part of the living area with ample storage with a large cupboard spaces either side of the bed. In the “living room” it has a beautiful wood burner and slate hearth to keep you and your guest’s nice and toasty in the colder months. Perfect for getting cozy on a drizzly day! The hut was hand built on a Ex-military chassis which was carefully restored and in excellent order! Very heavy duty and durable! 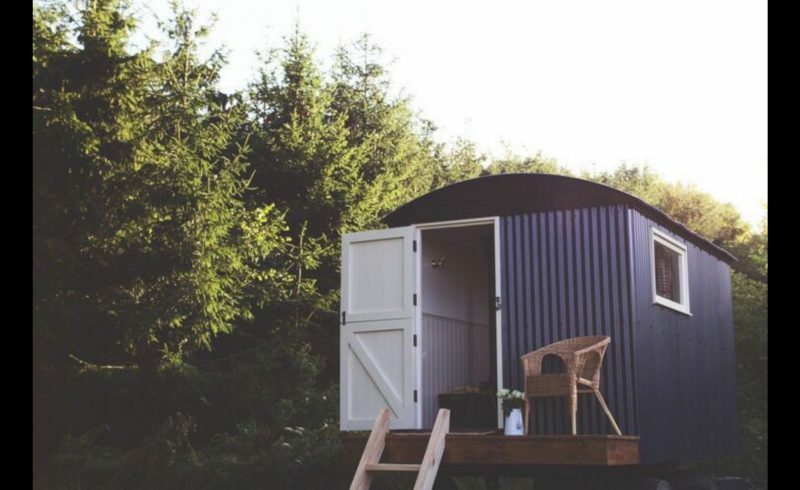 This is a very unique and bespoke Sheperd’s Hut, It is one of a kind and would make a perfect guest room, Office or Air BnB business rental opportunity.